The royal tomb of Pharaoh Psusennes I is one of the most spectacular of all the ancient Egyptian treasures – even more remarkable than that of Tutankhamun. So why hasn’t the world heard about it? What mysteries does it contain? And what does it reveal about ancient Egypt? The tomb was discovered filled with lavish jewels and treasure almost by accident in 1939 by the French archaeologist Pierre Montet while he was in northern Egypt. The royal burial chamber came as a complete surprise – no Egyptologist had anticipated a tomb of such grandeur in this area. Unfortunately, the tomb was found on the eve of World War II in Europe and attracted little attention. One of the most startling discoveries inside the tomb was the sarcophagus in which the body was held: It was made of silver with exquisite detail and craftsmanship. No other silver sarcophagus has ever been found and it is now recognized by many Egyptologists as one of the most exquisite artifacts of ancient Egypt ever to be found. The elaborate tribute within the tomb suggested it was the burial site of someone very important. Using the hieroglyphs inside the tomb, they pieced together the identity of the pharaoh: his powerful role in ancient Egypt, and why he received such grand treatment. The investigation reveals political intrigue, a lost city and a leader who united a country in turmoil and became the Silver Pharaoh. Narrator: For more than 5,000 years, tomb raiders plundered the graves of Egypt’s ancient pharaohs. By the 20th century, every royal tomb archaeologists entered had already been robbed – except one. Inside, was a prize beyond imagining. …Made entirely of silver, a treasure to rival that of Tutankhamun. But the destruction of World War II overshadowed the discovery. Dr Salima Ikram, American University, Cairo: It’s hard to imagine a worse time to make such a spectacular discovery. Narrator: Today, this incredible find still remains virtually unknown. Now, investigators have pieced together the silver pharaoh’s life and times, one of the least understood and most turbulent periods of Egypt’s history. Narrator: Egyptologists have reexamined the tomb and the fabulous city which surrounded it. And the first full examination of the pharaohs remains has revealed surprising results. Narrator: Using source material from the team who first discovered the tomb, investigators are decoding the message of these fabulous treasures to lift the veil on one of the most mysterious periods of Egypt’s history – the era of the silver pharaoh. February, 1940. Adolf Hitler has launched his blitzkrieg in Europe. The first savage blow in a war which will soon engulf the world. For the moment, Egypt is remote from the battlefield. At an excavation site near the Nile, a French archaeology team has been toiling for more than a decade. Now they’re racing to complete their work before war heads their way. Professor Pierre Montet, the archaeologist leading the team, has announced an extraordinary discovery. He’s uncovered a pharaoh about whom little is known, from an era few people know anything about. What Montet finds here will rewrite the story of ancient Egypt. It was a brief but dark era in ancient Egypt’s 3,000 year history. Egypt’s great pyramid was built by pharaoh Khufu in what’s called the 4th dynasty. The most famous pharaohs, people like Tutankhamun and Rameses the Great, ruled more than 1,000 years later in the 18th and 19th dynasties. The last of the pharaohs, Cleopatra, ruled another 1,000 years after that. Doctor Peter Lacovara is an Egyptologist who uses the evidence of inscriptions and hieroglyphs to chart this immense period of time. Dr Peter Lacovara: If you think about it, in history’s timeline, Cleopatra is actually closer to us than she was to the people who built the pyramids. Narrator: Historians believe Egypt was ruled by at least 170 pharaohs, though this is a difficult number to confirm. The tombs of 70 pharaohs remain undiscovered. … in the valley of the kings, at ancient Thebes, beside modern day Luxor, at the old capital of Memphis, close to where Cairo is today. Or maybe in the far north, the delta where the Nile splits into branches on its way to the sea. For Egyptologists, filling the gaps in Egyptian history is made more difficult by periods when the country was in political chaos. Dr Peter Lacovara, Egyptologist: In the Intermediate Period, we have economic downturn, we have civil war, the country’s split between north and south, even the threat of foreign invasion. Dr Peter Lacovara, Egyptologist: Civil discord is bad for archaeologists. We don’t have the great monuments, the historical inscriptions, the private statues. People are just too busy trying to stay alive. Narrator: The lack of archaeological evidence means there is still much to be learned about this era. Clues can be found in some of the best known stories in the world. Scholars place the Old Testament battle between David and Goliath right around this time, at 1020 BC. The Bible describes how a pharaoh of this era invaded the Holy Land around 950 BC. Dr Peter Lacovara, Egyptologist: On this wall we have Shoshank I, who was recorded in the Bible as Shishak, who sacked the Temple of Solomon and brought the Ark of the Covenant back to Egypt. Narrator: These tantalizing stories linking Egypt and the Holy Land are what inspired Pierre Montet. He began digging in 1928 at Tanis, in the Nile delta. Other archaeologists had already searched here, but Montet believed there could still be important finds buried in the sand. And soon, Montet’s hunch began to pay off. Through the 1930s, he uncovered the remains of a vast temple with inscriptions showing it was dedicated to Egypt’s supreme god, Amun. The temple compound was protected by a massive mud brick wall, inside which Montet believed there could be tombs waiting to be discovered. Hollywood even imagined the lost ark might be buried in Tanis. And like Indiana Jones, Montet had to deal with the threat of the Nazis. While Montet worked in the desert of Egypt, Europe was on the brink of war, with Adolf Hitler threatening to unleash his storm troopers at any moment. Dr Salima Ikram, American University, Cairo: Although Montet had found a great many carved blocks, pieces of temples and things, he hadn’t found anything truly spectacular that would set the world alight. Dr Salima Ikram, American University, Cairo: At the same time, there were all these rumblings of war in Europe, so he was always casting half an eye backwards to see what was going on, so it must have been an incredibly tense time for him. Narrator: In Tanis, Montet’s diggers had almost completed their sweep of the temple compound when they came to a spot close to the mud brick wall. Dr Salima Ikram, American University, Cairo: They were digging right here, at the south west corner of the temple, when they came upon the roof of an enormous tomb complex. As an archaeologist, Montet’s heart must have been pounding. Narrator: Montet quickly scrambled down into the tomb. In the shadows, he could make out a whole series of burial chambers. But his worst fears … were quickly confirmed. Dr Salima Ikram, American University, Cairo: Montet’s heart must have been sinking when he came in here because there was a hole in the roof and there wasn’t supposed to have been one, so obviously it must mean that tomb robbers had made their way here before he had. Narrator: It was a royal tomb, dating from around 850bc. Dr Salima Ikram, American University, Cairo: The inscriptions said that this tomb belonged to Osorkon II, who was a pharaoh of the 22nd Dynasty, and also some of his relatives were buried here. So it was a find, and in fact a significant find, but it certainly wasn’t an un-robbed, intact royal burial. Narrator: Montet knew the chances of finding an undisturbed tomb were unlikely. No archaeologist had ever found an intact pharaoh’s tomb before. But he refused to stop searching. Dr Salima Ikram: Montet ordered his workmen to extend the excavation area to about right here, only 10 yards away. Narrator: Incredibly, they found a second tomb complex next to the one which had been ransacked. Montet could hardly believe it. And this time, the tomb appeared to be intact. Was it possible tomb raiders overlooked this grave? Dr Salima Ikram, American University, Cairo: It’s surprising that the tomb robbers, who so successfully robbed this tomb, missed the one over there that’s only a few yards away. Maybe they didn’t realise that there was a whole mass of graves around here, but that would be surprising because tomb robbers were astonishingly good at reading the landscape and could ferret out tombs when even archaeologists have a hard time doing that. Narrator: Montet couldn’t be sure who was buried here. But as he entered the antechamber, the answer appeared. Dr Salima Ikram, American University, Cairo: Imagine Montet’s excitement when he stood at this very spot and shone a light up here, and saw a royal name, Pasebakhaenniut, and that means ‘The Star is Rising in the City, beloved of the God Amun’. And then he saw other royal names, because pharaohs have a panoply of royal names, and here is ‘Great are the Manifestations of Re, chosen of the God Amun’. So here we have a pharaoh’s tomb which seemed to be intact, and this pharaoh is really known by his Greek name which is Psusennes I.
Narrator: Montet knew little about Psusennes, one of a succession of pharaohs whose lives and times weren’t fully understood. He lived during the intermediate period, that dark age when power was divided between rulers. Psusennes reigned near the beginning of this chaotic era. He ruled the north of Egypt from here in Tanis. But the real power and wealth lay in the south, in the ancient capital of Thebes. Much is known about the Theban rulers from the monuments and treasures they left behind. But who were these northern kings? Petty warlords? Or significant pharaohs, due a place in history? If Psusennes’ tomb really was intact, then Montet’s find could fill one of the yawning gaps in Egypt’s story. The doorway of the burial chamber itself was still tightly sealed with a massive block of solid granite. It took six days of back-breaking work to shatter it into pieces. Then, finally, Montet could enter the tomb itself. It was all he could have ever hoped for. Dr Salima Ikram, American University, Cairo: Montet said the tomb was filled with marvels worthy of the Thousand and One Nights and, indeed, it was because on the floor of the tomb right here there were hundreds of figurines. There were gemstones, precious metals. Narrator: Montet knew he was the first person to touch these treasures since they were placed there 3,000 years earlier. This photograph, taken moments after Montet entered, shows exactly what he saw. But, there was no sign of a mummy or casket. They lay, as is typical in pharaonic tombs, inside a huge stone sarcophagus which almost filled the chamber. It was carved, and covered in hieroglyphs. Today, the massive lid is on display here in the Egyptian Museum. Inside was another sarcophagus, also richly carved. Montet and his team had to pry open these granite sarcophagi carefully to reveal the pharaoh’s actual casket within. … the king of Egypt himself. Montet agreed to leave the most important find, Psusennes’ casket, sealed until the king was there to behold the incredible discovery. King Farouk had been supporting Montet’s expedition and arrived at the dig dressed every inch the explorer. 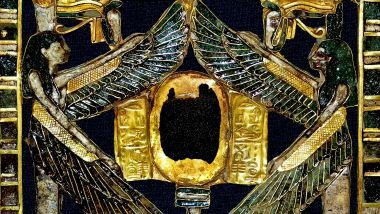 Montet pointed out the cartouche, which showed the signature of the man who was Egypt’s king 3,000 years before. But King Farouk wanted to see treasure, not carvings. He’d been promised something unique, completely different from what he had seen so often on other digs. The casket was a human form, forged in silver instead of the familiar gold. Nothing like it had ever been found before or since. Here lay a little-known ruler from Egypt’s turbulent dark age. But his tomb and its riches seemed to put him alongside the mightiest of pharaohs. And what lay inside the silver casket only deepened the mystery of who this little-known pharaoh was. The mummy’s death mask was solid gold. This was no small-time warlord or regional strong man, but someone with enormous wealth and power. Dr Peter Lacovara, Egyptologist: It was not just gold and silver that’s in Psusennes’ tomb but lapis lazuli and in huge quantities, far more than in Tutankhamun’s tomb. Dr Peter Lacovara, Egyptologist: And this was material that had to be imported from Afghanistan, 3,000 miles away. So incredibly prized and incredibly valuable. … the star representing Psusennes rising over the city of Tanis. Their value wasn’t simply in the quantity of precious metal but the quality of the craftsmanship. Dr Peter Lacovara: They’re beautifully made, beautifully designed, clearly for an individual who could appreciate these great aesthetics. Narrator: Montet needed months to meticulously examine the incredible treasures he’d found, but he didn’t have that luxury. He’d made the find of a lifetime, but his timing could not have been worse. Back in Europe, Hitler’s armies arrived at the French border; invasion was only weeks away. The Nazis were expected to strike at any moment. Montet had a heartrending decision to make. His family, a wife and three little girls, had been out in Egypt with him, sharing the excitement as each new discovery came to light. But they had since returned to France. Should he stay to complete his work, or quit to be with his family? It didn’t take long to decide. Montet packed up the treasures from the tomb and ordered the excavation sites be shut down. Work ceased and Montet rushed back to his family in France as World War II began to rage. He wouldn’t make it back to Egypt for five years. The treasures were quickly transported to Cairo for safe-keeping in a museum vault. Though it was one of the great moments in archaeology, Montet’s discovery of Psusennes barely made a ripple. Dr Salima Ikram, American University, Cairo: There was war going on in Europe so who was going to pay any attention to an archaeological find in Egypt? Because of this, even today we don’t really know enough about Montet’s amazing discovery. Narrator: When Tutankhamun was unearthed, nearly 20 years earlier, it made headlines around the world. And when his mummy was examined, the cameras were there too. It was a grand affair, conducted by a professor of anatomy at Cairo University, Professor Douglas Derry. In 1940, Professor Derry received another invitation. He was asked to examine an exciting find from northern Egypt: an obscure pharaoh named Psusennes. Or, at least, the parts of him that remained. Dr Salima Ikram, American University, Cairo: He was buried in the Nile Delta, which is a very wet, damp environment, while other people were buried in the Valley of the Kings, which is in the desert. So anyone buried in the Delta is prone to decompose because of the dampness. It’s very difficult to study mummies that were buried there. Derry carried out what now looks like a cursory examination. He could tell straight away that Psusennes died an old man, but he missed further important evidence. When Derry was finished, the bones were buried again, this time not in a royal tomb but deep in the university’s archives. Having been entombed for 3,000 years, Psusennes’ bones would now lay unstudied and unheralded for another 70. But now, Doctor Fawzi Gaballah, Derry’s successor as professor of anatomy, has reopened the examination. Prof. Fawzi Gaballah: I’m actually very excited to an extent that I can’t speak. Prof. Fawzi Gaballah: There is nothing published in detail about this skeleton which could explain his state of health and way of living. Narrator: Evidence from that first examination remained. The smaller bones were still tucked inside Professor Derry’s old cigarette packets. Although the soft tissue was gone, Psusennes’ bones revealed plenty about the pharaoh. He stood nearly five and a half feet tall and was powerfully built. As Derry noted, Psusennes died a very old man, perhaps approaching 80, at a time when the average lifespan was closer to 35. Wear and tear in the teeth confirmed Derry’s opinion. But astonishing new information has emerged from the professor’s examination, in particular from this seventh cervical vertebra, part of the king’s backbone. Prof. Fawzi Gaballah: This is a new finding which I discovered during my examination. This spine is broken and healed during the life of the king, and now it is healed. Look at the irregular, look at the bend, at the bend of the spine. It is not mentioned by Professor Derry. I discovered it, and this is called, a type of fracture called Shovels Fracture. And it may, it may point to the fact that this king was not leading a sedentary life. This fracture usually indicates hard work with the upper limbs. Narrator: The cause of Psusennes’ injury, undetected until now, remains unclear. But other pharaohs were known for working and playing hard. Tutankhamun went hunting, and may have even broken his leg in a hunting accident. Tuthmosis the third was one of Egypt’s great warrior kings … but also an avid gardener. He brought back rare plants from his foreign campaigns … to plant in the royal gardens. What kept Psusennes busy here in Tanis is a mystery which will now keep scholars guessing. Psusennes’ broken upper vertebra healed over time, but there was evidence of chronic disease in the lower backbone. Prof. Fawzi Gaballah: This king was suffering from a disease of connective tissue, a rheumatic disease in the form of ossification of the ligaments of the vertebral column. Professor Derry mentioned this, but didn’t diagnose the cause of this. Narrator: This first detailed examination of Psusennes’ bones provided important new insights into his life. And for the first time, a forensic artist could speculate on what Psusennes may have actually looked like. Melissa Dring, Forensic Artist: What is absolutely fascinating for anyone looking at this head is his right eye appears slightly higher than the left one. The socket is actually set higher, so this cheekbone starts higher and is set higher, there, than this one. Melissa Dring, Forensic Artist: It must be reflected in the face. Narrator: Melissa Dring holds a degree in the psychology of facial identification and studied forensic reconstruction with the FBI. Dead for 3,000 years, the sketch brings the silver pharaoh back to life. Melissa Dring, Forensic Artist: Psusennes … here he is. Melissa Dring, Forensic Artist: He’s physically extremely well built, he’s got a large head on a fairly short body, but he’s not been shy of using his body in energetic exercise of some kind. Melissa Dring, Forensic Artist: He’s also lost a lot of teeth on both sides, so you have something of the sort of the nutcracker look, because the jaw is able to close more firmly. Melissa Dring, Forensic Artist: It’s a determined mouth. It’s a no-nonsense look, I think. Narrator: Psusennes must have been in extreme pain in his last years with back problems, and also a tooth abscess so severe it forced a large opening in the roof of his mouth. Prof. Fawzi Gaballah:This is the cavity of the abscess and the infection was so heavy and extensive that it also opens on the inside, on the inside on the surface of the palate. This is the hard palate and, as we see, the opening is great and his abscess was great. Narrator: Psusennes suffered in agony for at least part of his life … but do his bones reveal anything about his death? Prof. Fawzi Gaballah: As far as I see from the bones, there is nothing apparent to lead to death. He could have died by heart attack, maybe something like that. Prof. Fawzi Gaballah: These bones show us the sufferings of his life, but not the cause of his death. Narrator: The fact that Psusennes lived so long, despite his medical history, tells Egyptologists that, above all, he was a survivor. Dr Salima Ikram, American University, Cairo: The fact that he was physically strong and long-lived absolutely must have contributed to his success as a ruler. He managed to reign for 46 years, which was a very long time. People like Tutankhamun died when they were teenagers, so someone like Psusennes really could make a difference. But Egyptologists still struggle to interpret this turbulent period around 1000 BC, when pharaohs like Psusennes had to share power with rivals in the south of the kingdom. Dr Peter Lacovara, Egypotologist: It’s ironic that this dark age in Egyptian history followed a period when the pharaohs were at their greatest height of power. Narrator: The turmoil that plagued Psussennes’ reign actually began 200 years earlier… and was started by the most powerful pharaoh of them all. Dr Peter Lacovara: Egypt reached the peak of its power under Rameses II, Rameses the Great. Dr Peter Lacovara: He was a prolific builder, the greatest builder that Egypt had ever seen, and had as many as 100 children. … Thebes … and Memphis. Rameses’ boundless ambition led him to build an entirely new capital in the Nile delta. He called it Pi-Ramesse, the house of Rameses. But Rameses could not see what his new city would mean for future pharaohs. Dr Peter Lacovara, Egypotologist, Emory University: The Delta region was really a frontier area for Egypt before Rameses really started to colonize it and build his great capital there. It sort of threw things off balance. While a strong central ruler like Rameses the Great could maintain control, once you had a weak ruler you could see the Delta kind of flying off on its own. Narrator: Creating a third power center left the pharaoh open to political attack. The trouble began here in Thebes. The only figure powerful enough to challenge a pharaoh was Egypt’s high priest who was in charge of the vast temple of Karnak. Dr Peter Lacovara, Egypotologist, Emory University: In some ways, the term High Priest is a bit misleading because he was more than just a religious official. He ran a big business which is what this temple was, he was an important political leader, and he could even command military might. Narrator: Priests were richly rewarded - in advance - for keeping the memory of a dead pharaoh alive. Dr Peter Lacovara, Egypotologist, Emory: A king would leave an estate to the temple and then the priests of the temple would maintain his cult, would maintain his monuments, keep his memory alive which was essential to the Egyptians. Dr Salima Ikram, American University, Cairo: Kings, to win their favour, would give them rights to fishing and fowling and hunting, or rights to mines, or even trade along the Nile. And so the priest would gain increasing amounts of wealth. Dr Peter Lacovara: They were just getting wealthier and wealthier as time went on, until they eventually decided why don’t we become king? Narrator: Shortly before Psusennes’ reign began, the high priests made their play for power. Dr Peter Lacovara, Egypotologist, Emory University: Here’s the High Priest shown as almost the same height as the pharaoh. You can see the other priests are much shorter, and previously in Egypt everyone was shorter than the pharaoh, to show their relative status, but here the High Priest has gained so much power that he’s almost equivalent to the pharaoh. Narrator: As the priests asserted their authority, Egypt was riven in two and five centuries of chaos—the intermediate period—would follow. The high priest seized the south and the pharaoh was exiled to the frontier region, the northern Delta. A checkpoint between the north and south was established on the Nile, close to Memphis. So how did Psusennes turn his small northern province into a rich domain, fit for a king? Investigators returned to the treasures from Psusennes’ tomb, looking for clues. Critical evidence was spotted on this small, seemingly insignificant silver dish, called a patera. Archaeologists recognized Psusennes’ familiar signature, including the star and bird. But this time, the cartouche contained a long series of further symbols. Dr Yasmin El Shazly, Egyptian Museum: The inscription on the patera reads ‘Life to the Perfect God, Lord of the two lands, the High Priest of Amun, King of the Gods, Beloved of Amun’, and then ‘Psusennes’. What’s very important about this is the fact that we know from this bowl that he held the title of High Priest of Amun in the north. Psusennes was more than just a pharaoh; he was a high priest as well. At last, the mystery of his fabulous treasure hoard was revealed. Dr Peter Lacovara, Egypotologist, Emory University: A pharaoh would traditionally derive his wealth from taxes. If you were a farmer, and that was most of the people of Egypt, you would have to give a certain proportion of your crop yield to the Treasury of the Pharaoh. Dr Peter Lacovara, Egypotologist, Emory: As we’ve seen, the High Priest was getting wealthier than the Pharaoh, but this way he’s combining both sources of income, the wealth of the temple as well as the traditional wealth of the Pharaoh. Narrator: But how did Psusennes carve out such a powerful position? A look at the family tree of Egypt’s ruling clan makes it clear. The branches lead to the family patriarch at the time when the southern priests revolted – high priest and strong man, Pinedjem. Dr Peter Lacovara, Egypotologist, Emory University: Pinedjem was High Priest here at the Temple of Karnak around 1070BC. He had four sons, three of whom succeeded him as High Priest, and one, Psusennes, went to Tanis where he became Pharaoh. But he was also given the title High Priest of Amun in the north. Narrator: Psusennes was a smart politician, determined to use those powerful family connections. Dr Peter Lacovara: … And therefore cemented further the relations between the north and the south. Narrator: By ensuring relatives made strategic alliances, Psusennes’ family had the whole of Egypt in their grasp. This is the patriarch, Pinedjem, whose mummy was found in Thebes. Psusennes’ mother, Princess Henuttawy, was buried there too, both mummies preserved in the dry desert climate. Again, Psusennes’s sarcophagus gave investigators evidence of just how powerful the family was. Carved in the granite, alongside Psusennes’ name, they found a totally different royal signature. Dr Yasmin El Shazly, Egyptian Museum: What’s very interesting about this cartouche is that if you look at it carefully you’ll see [UNSURE OF WORDS], the 19th sign of the King Merenptah. Even if you don’t know Ancient Egyptian it looks completely different to Psusennes I.
Narrator: Merenptah was the son of Rameses the great. He’d been buried near Thebes, roughly 150 years before Psusennes took the throne. But his tomb was opened up and the sarcophagus was sent to Tanis … as a family gift for Psusennes. Dr Peter Lacovara, Egypotologist, Emory University: It would have to have been dragged across the desert from the Valley of the Kings and loaded on to a fairly large ship in order to be brought to the north, and then bring it up to the Delta. Clearly they had to be friendly relations. You wouldn’t have been able to get it across the border had there been strife between the north and the south. Narrator: Psusennes ordered stonemasons to add his cartouche to the sarcophagus, next to the earlier one to show how his family had risen to join the ranks of the historical greats. Dr Peter Lacovara, Egypotologist: By using Merenptah’s sarcophagus, he’s associating himself with Rameses the Great, and associating for eternity with the great former rulers of Egypt. Narrator: The story surrounding the tomb of the silver pharaoh is not marked by chaos and strife but something far different. Through his family connections, and the making of political marriages and key alliances, Psusennes won wealth and power. But having won it, the question remains, how did he wield it? Recent discoveries prove that Psusennes was the driving force behind one of the most extraordinary feats of ancient times. Relocating a metropolis, stone by stone. The exact location of Rameses the Second’s fabled capital, Pi-Ramesse, was one of the world’s great archaeological mysteries. A city of about a quarter of a million people, one of the largest in the ancient world, vanished in the sands. Dr Salima Ikram, American: This is really the Holy Grail of Egyptian archaeology for many decades. Find Pi-Ramesse. …and he began to wonder about an amazing possibility. Had he found the archaeologists’ holy grail? Dr Salima Ikram, American University, Cairo: Montet was absolutely convinced that he had found the missing city of Pi-Ramesse, and so he went on record saying that Tanis and Pi-Ramesse were one and the same. And the reason he did this was because there were lots and lots of blocks and statues that he found here bearing the name of Rameses II, just like this one. Here you can see the cartouche royal name of Rameses II, so all of these cartouches that were scattered about through the entire site convinced Montet that here we have the city of Pi-Ramesse. Narrator: For Montet and archaeologists worldwide, this discovery was far more significant than uncovering a royal tomb. But Montet had made one critical mistake. On the surface, his theory made sense because Tanis was a riverside city. And ancient records showed that Pi-Ramesse was also beside the Nile. But in Egypt’s delta country, the river Nile doesn’t just stay put. And they switch location over time, as one area silts up and another is flooded. In the 1970s, archaeologists began to question Montet’s findings. They focused on a small settlement about 12 miles from Tanis. And discovered evidence of a long-lost branch of the Nile Montet had discounted. Dr Salima Ikram, American University, Cairo: They started to dig and found a huge cache of Ramesside Period pottery. So they brought in the ground penetrating radar to check out the site. The scans revealed a huge city. Narrator: The city’s foundations… the site where the Nile once flowed… and the ghostly image of Rameses’ lost city were all visible on these scans. There had been a temple here … as well as military installations. Dr Salima Ikram, American: They even found the stables of Rameses II. They were huge, and they must have had hundreds of horses in them. Dr Salima Ikram, American University, Cairo: In fact, where they used to practice we even have found the hoof prints of the horses when they were running around, so it really was an incredibly large complex city which had all the hallmarks of Rameses’ capital. Narrator: Today, not a trace of the city is visible above ground. And the vast buildings have totally disappeared. But how could such a large city simply vanish? Archaeologists now know that this branch of the Nile became so badly silted up that it changed course. Pi-ramesse was literally high and dry. Life there became unsustainable. The record shows it happened around the time Psusennes came to the throne, 1047 BC. And so he had the great monuments dismantled and shifted to tanis. Psusennes may not deserve credit for building a capital city, but he did rescue one. Dr Salima Ikram: Imagine what a vast undertaking this must have been. Dr Salima Ikram, American University, Cairo: It would have been like moving the monuments of Washington DC, the White House, the Lincoln Memorial, being dragged half way to Baltimore. Narrator: Without the radar scans, Psusennes’ amazing feat may have never emerged. Montet did find the great relics of Rameses’ fabled city. But Psusennes had moved them from their original site. Comparing remains found here with the scans, archaeologists could see that the temple at Pi-Ramesse was built in the same shape as the one Montet unearthed at Tanis. Psusennes was able to move an entire city—piece by piece. And it was from here that he wielded his incredible power as both the pharaoh and high priest. Dr Salima Ikram, American University, Cairo: This is clear evidence that Psusennes had the work force and organisation and good bureaucracy to move a city from one place to another. Dr Salima Ikram, American: He also had the gumption and the chutzpah to make this new city come alive. … how to face the afterlife. The choice of which objects to take to the tomb was an important one. But why, Egyptologists wondered, did he choose silver for his casket? 200 pounds of pure silver. 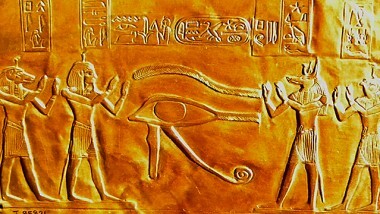 For ancient Egyptians, gold was known as the flesh of the gods. Because it does not rust or tarnish, the metal had the appearance of lasting forever, like the gods themselves. Silver was called the bones of the gods, because of its pale color and sheen. Ancient Egypt had natural gold reserves, but silver was scarce. In the early dynasties, it was considered more precious. But by Psusennes’ era, Egypt had developed foreign trade routes. Merchants began to glut the market with silver and by 1000 BC, its value had declined to roughly half that of gold. Psusennes could clearly afford the best: Some of his treasures rival those of Tutankhamun. Jon Privett, an archaeologist and a silversmith, has studied the question of why Psusennes chose silver. Jon Privett, Archaeologist: It would have been cheaper, not as expensive as gold, but the amount of work and the craft involved was considerable. Silver is a harder material, less malleable than gold to work. Silver requires to be heated every now and again to soften the crystalline structure of it to then carry on working it, a repeated process which involves time, labour, fuel. Jon Privett, Archaeologist: The craftsmanship involved is certainly more intense than gold. Narrator: Psusennes clearly wanted items of quality and artistry—and not just expense—to accompany him into the after life. The body section of the casket was beaten from sheets of silver so thin and delicate that in places, it was damaged during removal from the tomb. The head section is much thicker. Telltale marks around the nose and mouth suggest that it was cast in a mold, then hammered into shape. The Egyptians are known to have mastered the art of casting precious metals. From the first rough cast, which would have looked like this, Psusennes’ craftsmen then had to polish and sculpt their pharaoh’s features, a process which took hundreds of hours of painstaking work. Today, the silver casket is one of the great treasures of the Egyptian Museum, a permanent reminder of Pierre Montet’s amazing find. After the war, he made new discoveries but none as dazzling as the silver pharaoh. He died in 1966, still believing that the city he’d unearthed was Pi-Ramesse. But his remarkable discovery of Psusennes’ tomb remains one of the key moments in archaeology. Psusennes has never enjoyed the fame of Rameses or Tutankhamun, but his star is rising. Investigators are now taking on the work that Montet began and revealing the secrets of what was considered Egypt’s dark age. Dr Salima Ikram, American University, Cairo: Psusennes was really an incredible man. He moved the capital city from one place to the next, he also managed to build a spectacular tomb for himself which withstood the ravages of time as well as the attentions of tomb robbers. Dr Salima Ikram, American: He needs to be re-evaluated and we need to pay more attention to this remarkable pharaoh of the 21st Dynasty. Narrator: Psusennes would have believed that, by commanding such an elaborate burial, he was buying a ticket to immortality. 3,000 years later, we can look back and say that’s exactly what he’s done.